The more culturally diverse we become, the more adept we need to be in relating to people who hold profoundly different beliefs. What questions help you truly understand someone, especially someone with whom you have a fundamental disagreement? How do you engage people from different backgrounds when addressing community problems? People who learn these skills in their teens are able to decrease polarization at college, in the work place, and in interfaith communities where most of us live today. That was the goal we set for ourselves at Youth LEAD (Youth Leaders Engaging Across Differences), a project which began in Sharon, Massachusetts, in 2004. It provides interfaith leadership training for approximately 50 teenagers each year, young people who have gone on to responsibilities and projects receiving national attention and commendation. And now, collaborating with interfaith and community organizations, Youth LEAD is creating partner communities across Massachusetts and the country. The learning sounds simple but is not easy to absorb. Acquiring reconciling habits requires time taken reflecting on your own values and beliefs. It calls for specific skill-sets along with the confidence to reach out and connect across the widest chasms of difference. And for teachers and facilitators, it requires a profound conviction that youth and young adults deserve a vital, collaborative role in addressing local and global challenges, right now. 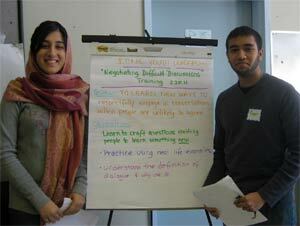 Youth LEAD (YL) participants each begin with the challenge of articulating what they believe to the whole group. Doing so provides a fresh clarity about their beliefs and opinions and creates confidence and a stronger sense of self, important steps in being able to communicate with people who disagree. A young person, clear and secure in his or her own faith, is not just “going along” with what “I’m supposed to believe” and is less likely to feel threatened by others or feel the need to convert them. Indeed, a democracy depends upon citizens being able to understand why they hold their beliefs and how to defend them, rather than attacking or blindly following the pack. In the context of personal reflection and with the skills of engaging each other respectfully, high school students have what they need to plan and run programs that develop a healthy culture of pluralism. Instead of creating a curriculum for teens, teens are asked to identify barriers or problems among different religious and ethnic groups in their own communities and to propose ways to address them. Adults can provide young people with dialogue questions. But until we teach them to develop their own questions, they are ill-equipped to lead respectful conversations about polarizing topics that emerge spontaneously at school, a workplace, or anywhere else. Adults can plan a youth diversity conference, but until young people learn how to plan and run their own programs, they may not know how to transform problems into opportunities. Of course, this is not about “We’d like you to organize next year’s conference – so get back to us when you’ve decided what you want to do.” It is about leadership training. Youth LEADers complete six day-long training sessions that focus on skill-sets in three arenas – communication, facilitation, and organizing. Adult mentors working with teen participants take a day-long mentoring workshop. Introduction to Facilitation, Advanced Facilitation, & Dialogue Facilitation Tomorrow’s leaders will be called not only to engage in difficult conversations but to actively engage others. YL’s three facilitation workshops focus on skills needed to speak comfortably in front of a group, give and receive feedback in a self-affirming way, and lead group discussions. For topics usually too hot to handle, participants learn tools to facilitate a structured dialogue.“I'm probably the person who's most likely to mediate a discussionabout different views or ask deep questions about someone else's point of view,” shares Daisy, a Youth LEAD alum and Christian Scientist now at Bowdoin College. Building the confidence to speak against intolerance and engage others requires feedback and guidance from adult mentors who’ve learned not to try to control the outcome. A teen’s vision and action steps may not look like yours or mine. Accepting that graciously can be the most difficult aspect of being a mentor. As we nurture and support, we must be willing to let go, even if it means the project doesn’t meet our goals, or ultimately, their expectations. Based upon a three-year study of enrolled teens and interviews with alums, we’ve begun to see patterns that corroborate what individual teens have said anecdotally for years. Attitudes, habits, and behaviors are complex and form over many years. They do not change in two or three weeks, even with the most brilliant intervention or peace program. Youth LEADers long-term engagement is critical in changing not only their own habits and beliefs, but also challenging stereotypes held by their family and community. When Youth LEADers bring people together on a local level and reap positive, tangible results, it shows young people and their communities that it is possible to change things for the better. Youth LEAD has sourced leadership training programs for more than 4,000 teens since 2004. Founder and director Janet Penn has taught the model across America and in Jordan and India. YL has been recognized as an exemplary program by Harvard’s Pluralism Project and UNESCO. Youth LEAD’s website brings you up-to-date about the group’s current activities. Ed.